What's the only non-portable Nintendo system capable of being powered entirely by batteries? If you answered "Color TV Game 6," shut up you smart-hole! The real answer is the Famicom Disk System, Nintendo's magnetic disk-based add-on to the wildly popular Famicom (known as the NES in the western world). Yes, atop the Disk System's flat, red case rests a gaping maw, ready to accept a frankly ridiculous six C-cells. 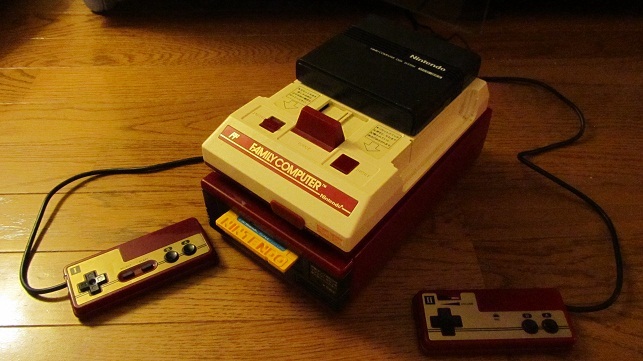 If you've never seen one of these things in person before it's perhaps the first thing you'll notice after getting one in your hands—most interweb images of the unit show the Famicom itself sitting on top of the add-on, covering the panel. Since I have an AC adapter and live in an era of power strips, I like to use the compartment as a storage space for all my secret money. But anyway, why would Nintendo, ever-conscious of the space their systems require, add a largely empty space-gobbling hole for battery support? Easy! In typical, kind-hearted Nintendo fashion, the company theorized that Famicom owners might already have a standard outlet full with a plug for the television and another for the Famicom's power brick, and so included the option—Nintendo's user-oriented design at work. The system is surprisingly light, in no doubt because of the mostly hollow plastic body. Notably, since the Disk System only loads from the disk occasionally, the six batteries can power a system through many months of regular play! 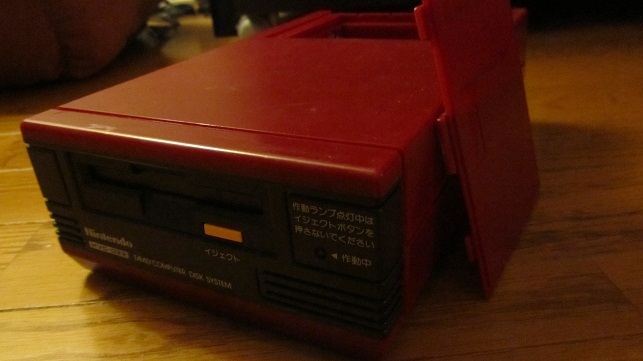 This is just one of the many little curiosities about the Famicom Disk System that has ensured that to this day it remains an interesting, and to many, enigmatic, red plastic box. Created by the original designer of the Famicom, Masayuki Uemura, and Nintendo R&D2, the Famicom Disk System was released in Japan in February of 1986. That's about three years after the Famicom itself, which came out in July of 1983 in Japan. The Disk System sought to ease a couple serious problems for game developers of the time: storage and cost. With games growing in size and requiring more graphical data, sound, and program code, developers often found themselves constrained by the expense of physical cartridge ROM chips as well as their relatively small storage capacities. The Disk System, which allowed games to be distributed on relatively cheap magnetic disks, gave many developers of the time a chance to distribute larger games more cheaply. It also has the side effect of making the "Family Computer" really feel like one, as you click the little disks into the drive and occasionally flip them over. The disks allow for 128KB of storage, spanning both sides of a single disk—double the amount of space used by an average Famicom cartridge. The way this data is actually passed to the Famicom system itself is ironically through a cartridge anyway—the Famicom Disk System RAM Adapter. 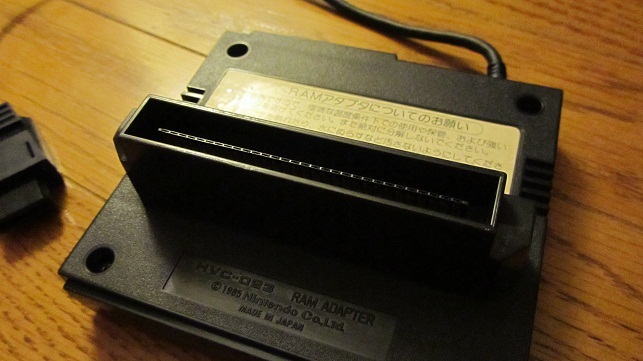 The RAM Adapter, which connects via a cord to the back of the Disk System and fits really snugly into the Famicom system's cart slot, contains a few goodies of its own: 32KB of RAM with which to hold the program of the game itself, and 8 more KB to be used for graphics data. It also contains a special processor, a concept that would later be used on the Super NES with stuff like the Super FX and DSP-1 chips, which enabled rotation, scaling, and graphic compression. This special processor controls the disk drive itself, and also adds another set of sound capabilities to the system, enabling some more detailed sound effects on FDS games that include them. In fact, several notable games that we happen to know as NES titles actually saw their debuts on the Famicom Disk System, and these original versions of the games are uniformly more feature-rich than any eventually-released NES editions. The Legend of Zelda, Zelda II: Adventure of Link, Kid Icarus, Ice Hockey, the original Castlevania, and many others were all released first for the Disk System, with some games seeing a cartridge release only many years later, if at all (the original Zelda was finally released on cartridge in Japan in 1994, three years after A Link to the Past for Super Famicom). Perhaps the most notable Disk System original was the original Metroid, which, when compared to the hobbled NES version, gets the edge in a few categories. Sound-wise, it opens with a more instrumented title screen theme, while in-game, numerous sound effects are of a higher quality: the "fwoosh" of passing through doors between rooms, enemy defeat noises, and even some realistic Ridley roars echo out as you progress through Zebes. Enhanced background music is also present, with the FDS adding another channel of sound, making the NES version sound somewhat empty in comparison. Later titles went on to use the new sound hardware to even greater effect. The NES cartridge version is on the left, the Disk System version on the right. Also featured in Metroid (and many other games) on the Disk System is an on-board save system, made possible by the ability of the disk drive to rewrite data. The game itself actually presents a Zelda-esque file selection screen, complete with super-cute Samus icon. 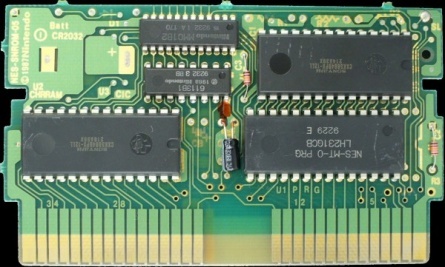 Interestingly, the circuit board used for the NES version of Metroid is actually the first of Nintendo's to support battery-backed RAM save data, though this feature was omitted during production and replaced with a password system, presumably for cost purposes. You can see where the battery would have gone in the upper-left corner. Just as Famicom cartridges are not the same size as NES carts, neither are standard Disk System disks the same size as regular floppy disks. They also primarily lack shutters over the exposed sections. 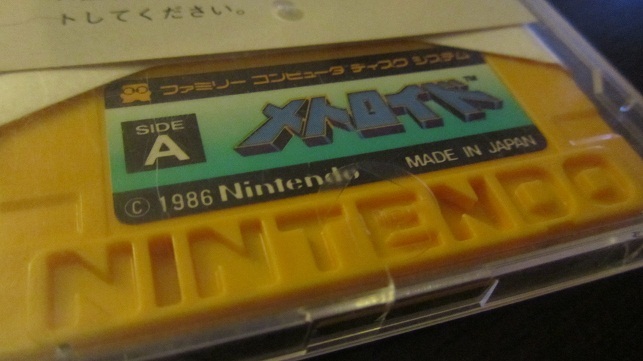 Nintendo instead distributed the disks in waxed paper sleeves, themselves slid into hard plastic flip-open cases. These were usually then packaged into thinner plastic boxes with a manual, and sealed shut. These days, most surviving disk system games lack the external plastic boxes and manuals, with games that include them commanding not-insignificant price premiums. Nintendo did release a few games using special, blue-colored disks with black plastic shutters. These titles were compatible with an interesting device called the Disk Fax. 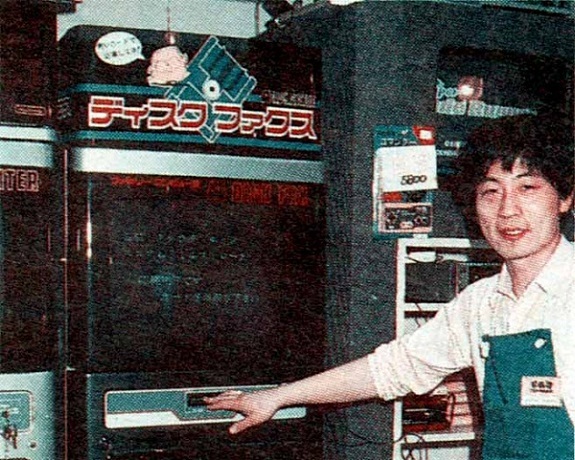 Users could save their scores on titles like Golf or the Famicom Grand Prix racing games, then take them to special kiosks set up in game stores around Japan. The player could insert their disks into the machine, where the scores would be read and then sent to Nintendo's data center for use in a variety of competitions which took place in 1987 and 1988. Some of the most rare Nintendo items ever produced were used exclusively as prizes in these contests—gold Punch-Out!! cartridges, special gold-colored Golf disks, stationary sets, and even Super Mario Bros. Game & Watch systems—all limited to 10,000 units each. Most of the items were packaged in plastic cases resembling Disk-kun, the official Disk System mascot, and the only time Nintendo's ever created a brand new character just to represent hardware. Even today, these rewards command absolute top dollar (from around $100 all the way up to a couple thousand, depending on condition and completeness) and are the holy grails of Nintendo collecting in Japan. The Disk Fax was often located next to a more critical Nintendo-provided kiosk, though. Via the magic of one of Nintendo's most interesting retail efforts, the Disk Writer, gamers were able to easily obtain new games or even create their own compilation disks as they saw fit. For a minimal cost of 500 yen (about the sixth of the retail price of many games), a user could obtain one of a variety of games by way of the in-store Disk Writer kiosk, operated behind the counter by an employee. 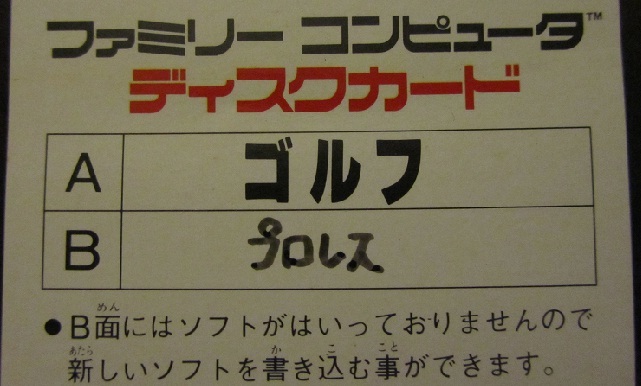 Customers could purchase blank disks or write to the blank sides of single-sided disks, and retailers would either distribute labels and printed instruction sheets for the games that customers had written to their disks, or offer the customers a form which they could mail together with 100 yen to Nintendo for a retail-quality manual. Because of the separate sides, the disks can actually accommodate two fully distinct games, one on each side, enabling at least one total-dream possibility disk: the retail Super Mario Bros. 2 with the original Super Mario Bros. written to side B. 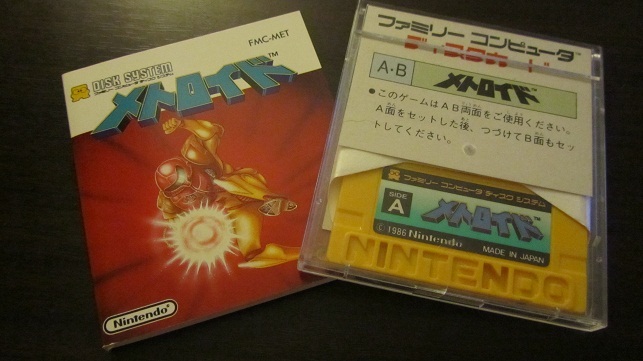 Most earlier Famicom games have no trouble fitting entirely on one side of the disk. One disk that I purchased actually contains Golf on one side and Pro Wrestling on the other (with プロレス, Puroresu, carefully written onto the disk sleeve in black pen), and I have another disk with Baseball and Soccer. In some cases the disk can be removed post-load while play continues, and you can even reset the system, since the game itself has already been loaded into RAM. Many games can be played to a certain extent without the disk in the drive after loading, though once the disk drive needs to search for data again you'll likely be hit with a cryptic error code. Most games, which take up both sides of a single disk, are booted with side A facing up, at which point the game often prompts you to flip the disk to side B. You can then press the little yellow button on the front of the system to eject the disk, then flip it over, put it back in, and wait as the system automatically detects and begins reading it. Games like Doki Doki Panic (which would eventually morph into the American Super Mario Bros. 2), are loaded with side A, switched to side B for gameplay, and ask the player to flip the disk back to side A in order to save game progress after a game over. Other games, ever-so-large, span not only both sides of a single disk, but both sides of two disks—primarily graphic and text adventures. These games were often released serially, as with the first Famicom Detective Club game, the first part of which was released in April 1988, with the second disk coming in June. One interesting release was one of the last games released for the Disk System (almost eight months after the release of the Super Famicom). This game, a time-travelling graphic adventure called Time Twist, was developed by Nintendo EAD and released, in two halves, on July 26, 1991. The second disk could only be accessed after the player had completed the first one. What about a Famicom Disk System with no disk? 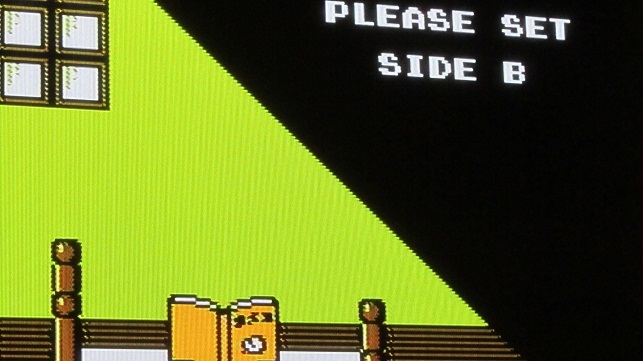 As it turns out, the FDS is perhaps the first video game system in history to include a standard "boot" screen when turned on, even when no disk is inserted in the drive. Diskless users are treated to a fanfare song, followed by a little comedy routine featuring the Mario Bros. incarnations of Mario and Luigi, where the two brothers have a little scuffle over turning the "lights" on and off of a large Nintendo sign that features a message telling the user to please insert a disk card. That's right, the soothing, gentle tones of the Nintendo GameCube menu are lifted right from the Famicom Disk System, though massively slowed down. Speaking of system curiosities, one of the most interesting has to be the system's form of hardware copy protection. Inside every disk drive there is a plastic block with raised NINTENDO letters stamped on it, to match up with the indentations on official disks. When the disk is loaded, this has to physically match up for the disk to click down into place. The first "I" and last "N" are also sunk further into the official disks, and raised more on the system's verification block. Of course, those tricky pirates ended up designing disks with larger indentations so that the NINTENDO text could click into place anyway. The eventual end of the Disk System was foretold a mere four months after its launch, in June 1986, with the release of Capcom's Ghosts n' Goblins, the first cartridge with the same capacity as a Disk System disk. In July, Ganbare Goemon! was released by Konami, the first 256KB game (double the size of a disk). By 1987, battery-backed SRAM started appearing in cartridges, enabling easy game saves, and by 1989, more advanced mapper chips allowed Famicom cartridges to surpass the basic abilities of the standard Famicom hardware. Nevertheless, the Disk System went on to enjoy its greatest popularity through 1988 and 1989, though as piracy took its toll and cartridges continued to increase in size and functionality, releases slowed to a trickle by 1990 and all but stopped thereafter. ROM chips continued to decrease in cost rapidly and increased in size just as quickly. By 1990, Dragon Quest IV, boasting a whopping eight times the storage space of a single FDS disk, was released as a Famicom cartridge. Other games, like Kirby's Adventure and the Japan-only Metal Slader Glory, were some of the largest Famicom games, surpassing the capacity of a Disk System disk by several times. The final game ever released for the FDS? Janken Disk Jou in December 1992, a paper-rock-scissors game featuring the Disk System mascot, Disk-kun. 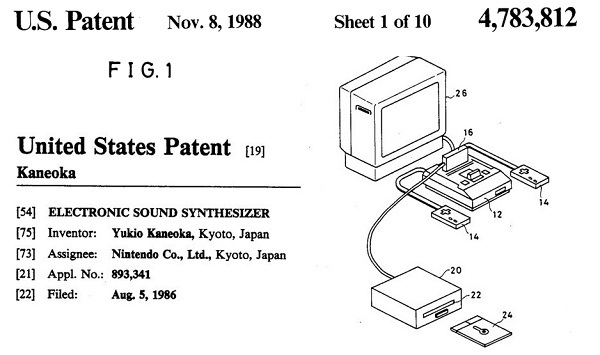 Curiously, Nintendo actually filed for U.S. Patent #4,860,198 only a month after the Disk System was released in Japan, in April of 1986. This patent, the catchy-titled "Recordable data device having identification symbols formed thereon and cooperating data processing system having registering symbols," is the kit and kaboodle of the Disk System's copy protection mechanism mentioned above. The patent itself sports drawings of the disks, the drive housing, the verification NINTENDO block, and more, and seems to suggest that Nintendo, perhaps bolstered by the early success of their NES in America, had planned on releasing the Disk System in North America. They followed this patent with another one, #4,783,812, in August—this one dealt with the extra sound processor in the FDS RAM Adapter—but that's the last there is of Disk System-related patents to be found. Though it's entirely my own speculation, I think it's reasonable to assume that by the time the patents were approved, Nintendo had all but axed plans to release the FDS in the States, opting instead to bring out cartridge versions of the most popular games. Taking into account the relatively quick tapering off of the Disk System's lifespan in Japan, along with the theoretical costs of redesigning the hardware to match the NES, it seems logical that Nintendo of America would have been disinterested in releasing a dead-on-arrival peripheral, potentially harming their good will with customers. There would have also been a variety of technical issues, not the least of which would have been working around a pin-out incompatibility between the 60-pin Famicom cartridge design and the 72-pin NES cartridge slot design. The NES excluded the two extra cartridge pins that the FDS used to pass through its FM synthesizer's improved sound, in favor of support for a never-used expansion port on the bottom of the NES unit (did you know it's there, under a plastic cover?) and support for the infamous NES10 lockout chip. A combination of these issues likely shuttered the project before it made it too far. I figure other considerations surely included the less-dense retail concentration in North America when it came to the Disk Writer service, and—perhaps—the focus on the NES as being the Nintendo "Entertainment" System, and not a Famicom, or Family "Computer." Marketing was key to the success of the NES in the post-crash American 1980s, a fact to which "Mr. Nintendo" Howard Philips, his army of Nintendo Power editors, and his shiny bow tie could surely attest. Interestingly, it's quite possible that the extensive conversion process of Doki Doki Panic to Super Mario Bros. 2 (in favor of the original, which NOA reportedly disliked due to its similarity to the original and extreme difficulty) and Zelda II: Adventure of Link—which were only released in America over a year after their 1987 Japanese releases—also contributed to the famous American delays and "chip shortages" we heard so much about during the fall of 1988. This may have occurred as Nintendo of America, trying to iron out future software lineups in 1987, struggled to decide exactly whether or not to adopt the disk format in America. Nintendo Power magazines of the time tell a tale of impatient consumers and NOA public relations running world-class damage control (a skill they've done their best to hang onto even today). Perhaps most notable is a missive I found while digging through the September 1988 issue, penned by Link himself, all the way from Shigeru Miyamoto's desk at Nintendo HQ in Kyoto, Japan—not the first "please keep waiting" dispatch of the year by any stretch. Ultimately, Nintendo only filed two patents relating to the Disk System, and nothing related to the potential American redesign of the hardware to accommodate the NES, suggesting the North American plans for the project were ultimately abandoned. Not long after they show up in the US Patent Office databases chronologically, drawings of Super Famicom system cases, cartridges, and later Lance Barr's original design for the case of the Super Nintendo show up, and the rest is history, marching ever forward into that great 16-bit era. These days, Disk System owners often find themselves struggling with hardware issues, spurned on surely in no small way by the fact that the unit, complete with moving parts, was likely not designed to last anywhere near twenty-five years. The disks are easily damaged, especially since the majority of them lack shutters, and are completely unusable if even a single part of the disk is corrupted. System-wise, the rubber drive belt, which spins the disk-reading head by way of the drive motor, is known to become brittle and fragile with age, often disintegrating and rendering the drive inoperable. In addition, the belt itself is non-standard, just as the disks are, and so a small hobby industry has cropped up to assist with the restoration of finicky old Disk Systems. Though my own Disk System, which I picked up in Osaka not that long ago, seems to run as slick as a whistle, it may very well have been recently serviced. Shockingly, Nintendo continued to officially repair Disk System hardware in Japan until 2007, when parts finally became scarce, and the company even allowed customers to send in their disks for Disk Writer services until 2003, long after the kiosks themselves had been removed from most stores. Gamer legend has it that all the original Disk Writer kiosks are still being stored "in the basement" at Nintendo HQ in Kyoto, as no units have ever turned up in the collector's market and the internal workings of the devices remain largely unknown. Though they are not even remotely as common as Famicom cartridges themselves, Disk System disks can still be found—in various states of completion—at retro game stores and media recycle shops in Japan. Sometimes they're still in the packages as sold, sometimes they're disks produced with Disk Writer kiosks. Sometimes they have the waxed paper sleeves, plastic cases, or nothing at all. I especially enjoy encountering the user-customized strange combination disks, due to the flexibility allowed in writing different games on either side via Disk Writer systems—The Goonies and Volleyball? Tennis and Pac-Man? It's fun to see the states that the disks were left in before being traded or sold off to eventually find their ways to second-hand stores. This big old red box is undoubtedly a relic of the past, but there's something that still remains interesting about it all these years later. Seeing NINTENDO emblazoned in yellow plastic on a floppy disk is still a cool moment for me as a Nintendo fan, as is even the simplicity of ejecting, flipping, and clicking a disk back into the drive, listening as the drive whirs up. The disks themselves, in their little plastic cases, are also entertainingly attractive, and quite small to boot—in the same space as a few cartridges, you can easily store several more disks. There's also an appeal to collecting Disk System games: in many cases, the best first-party Nintendo titles of the Famicom era appeared first—and often only—on Disk System. The original installments of the now-legendary Metroid, Kid Icarus, and Zelda series are all Disk System originals. More than anything, playing with my Disk System, for me, is about setting the Famicom on top of the box, pulling it out from the TV stand and sitting cross-legged on the middle of the floor, right up next to it with that red and gold controller in my hand, pathetically short three-foot cable connecting it to the system, clicking a disk in, and just watching it do what it does. And playing games on it isn't so bad either.